Icy Bug, originally uploaded by nataraj_hauser. We don't just get snow here in southern Wisconsin. No siree. Sometimes we get a quarter inch of ICE, then snow. Makes cleaning off your car before work a bit time consuming. 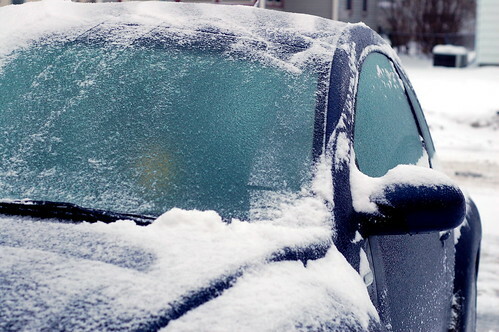 You get an idea of just how thick the ice is here, not only on the windshield, but even on the car itself. The slight yellow blur in the windshield is the fake flower I keep in the built in bud vase during the winter. hmmm...winter weather, what is that? Ain't got that down here in Wmsbg, Virginny!